Once you contact a company and show any interest at all – what happens next? Your inbox is flooded with reminders. Your phone cluttered with frequent voicemails. We don’t want to be a pain in your neck… we just want to help you discover your options. Give us a call and let’s figure it all out — we think you’ll be pleased with what you hear. We do everything we can to exceed expectations in providing quick, accurate and dependable medical billing services for dentists treating Obstructive Sleep Apnea (OSA) disorder. Built on a commitment to offer the highest level of customer service, Brady Billing was created by a dental office for dental offices. We understand how difficult it can be to incorporate new treatments at your practice, and unlike typical medical billing companies, we understand what you do. It is our goal to create a relationship that lasts for years to come through working one-on-one with your office to ensure exceptional customer service for you and your patients. "What to say about Brady Billing and their wonderful team....more like what not to say. When our office first starting billing to medical insurance for sleep apnea we were using another company. The other company was not on the same level as Brady Billing. 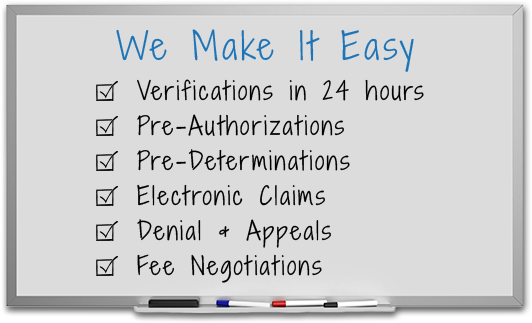 We would wait a week for the verification alone, and would never receive updates on claims. We have been with Brady Billing going on our second year now and never once had any issues. Erin and Megan are not only professional and knowledgeable, but they go above and beyond to help your practice grow and learn the trickiness of medical billing. I would recommend any practice that wants to be successful to use Brady Billing, they are the best out there."